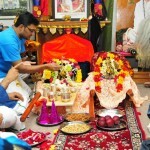 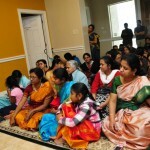 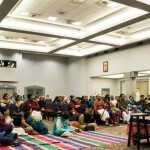 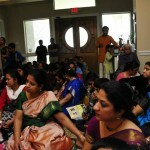 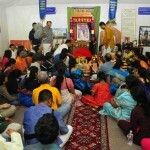 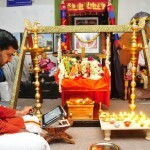 Categories: Houston Namadwaar Event, Srimad Bhagavata Saptaham. 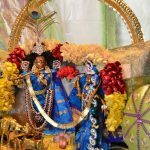 Dec 21 to 27, 2014 was a joyous, blissful week in Houston with the Srimad Bhagavata Mahotsava and Grand Madhura Utsav held at Houston Namadwaar. 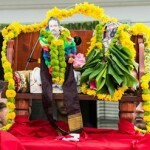 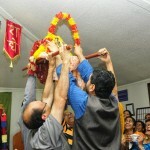 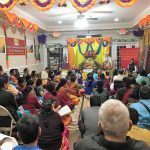 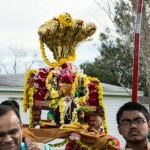 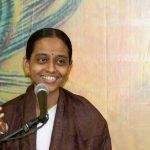 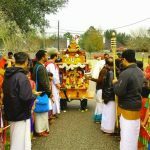 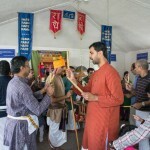 Along with the numerous Houston devotees, over 100 devotees from across the USA came to Houston for this celebration – from Orlando, Richmond-VA, Raleigh-NC, Boston, New Hampshire, Atlanta, Chicago, Minneapolis, Dallas, Austin, Bay Area-CA, Redding-CA and other cities. 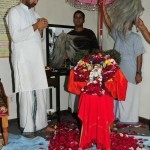 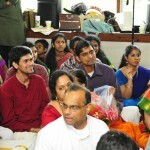 The days were packed with kirtanam and katha shravanam with little chance to think of anything other than Bhagavan. 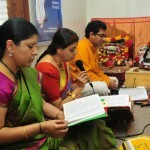 Every day began with Prabodhanam and Tiruppavai recital at 6 am. 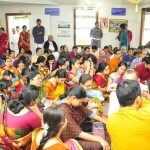 This was followed by the commencement of Srimad Bhagavata parayanam (18000 slokas in 7 days) which went on until about 1pm daily. 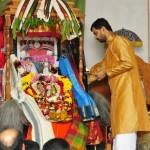 Simultaneously, in the mornings there was either vahanam processions or Sampradaya bhajan with Sri Jayadeva Ashtapadis and kirtans of numerous other mahatmas including Sri Thyagaraja, Sri Purandara Dasa, Sri Bhadrachala Ramadasa, Panduranga bhaktas’ abhangs and Sri Sri Muralidhara Swamiji. 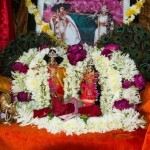 Vahanams that Lord Krishna and Sri Radha Devi were carried on, on various days included Sesha vahanam, Kudirai (horse) vahanam, Yaanai (elephant) vahanam and Garuda vahanam. 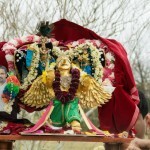 It was a blissful sight to see the Lord gallop fast on His horse, move majestically on His elephant and glide wonderfully on His Garuda. 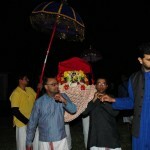 Every evening was magical, as everyone was transported to Gokula and Brindavana through the wonderful exposition of Sri Krishna Leela by Sri Ramanujamji, disciple of HH Sri Sri Muralidhara Swamiji. 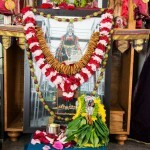 Sri Ramanujamji delved to great depths into many of Sri Krishna’s bala leelas, bringing out and explaining many enjoyable points in the stories through the commentaries of various mahatmas. 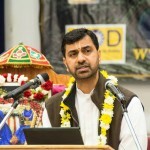 It was truly an amazing discourse series. 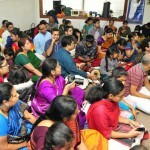 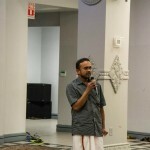 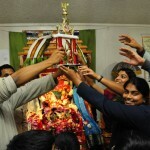 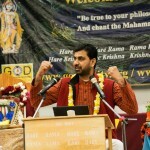 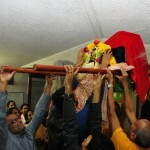 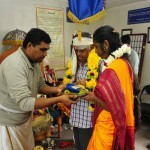 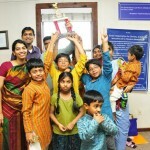 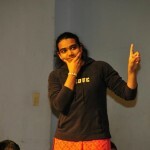 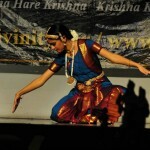 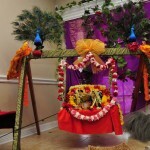 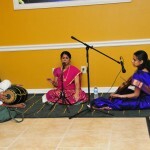 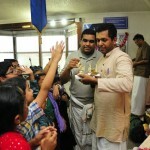 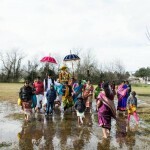 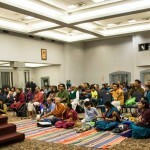 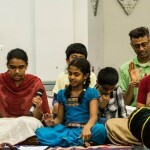 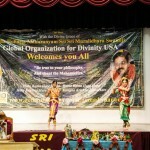 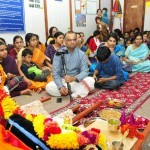 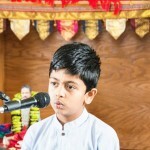 This series was held at Sri Meenakshi Temple in Houston. 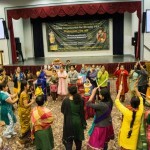 On a couple of days, after the discourse, the day of Krishna Jananam and Rasa Leela, women devotees danced in joy and celebration, around Bala Krishna and Sri Radha-Krishna respectively. 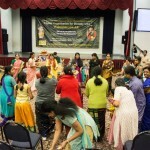 The discourse series was preceded daily by dance performances by Houston dancers including students of Ms. Sravanthi Modali (Kuchipudi), Ms. Rathna Kumar (Bharatanatyam), Ms. Supradipta Datta (Odissi), Ms. Indrani Parthasarathy (Bharatanatyam) and Ms. Padmini Chari and Ms. Surabi Veeraragavan (Bharatanatyam). 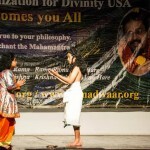 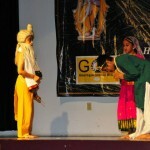 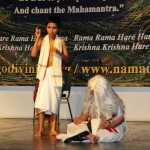 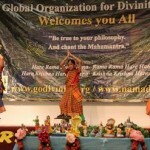 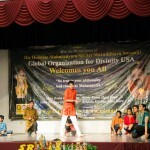 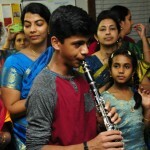 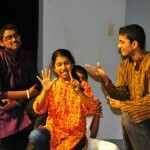 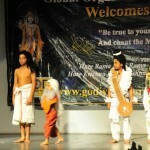 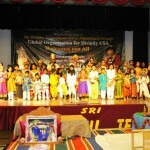 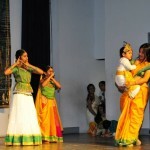 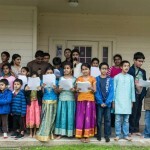 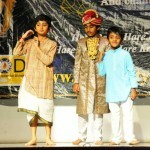 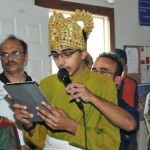 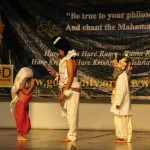 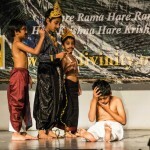 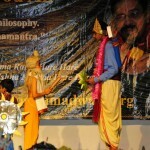 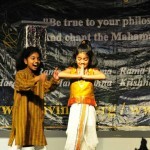 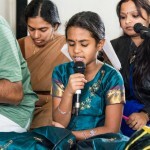 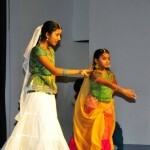 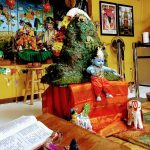 On one day, Gopa Kuteeram children from all across the USA presented a play depicting all the cantos of Srimad Bhagavatam, and on another, Gopa Kuteeram Youth presented a “Street Play” on how they follow Bhagavata Dharma. 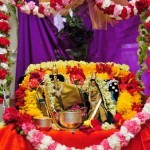 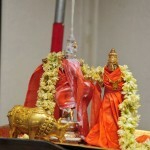 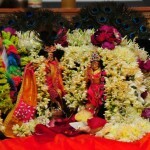 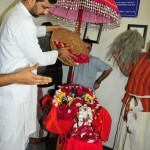 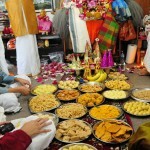 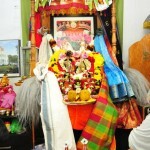 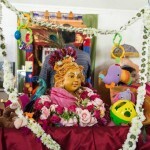 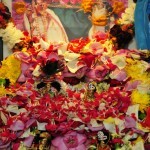 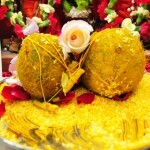 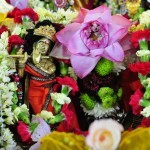 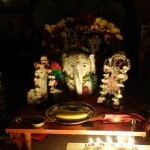 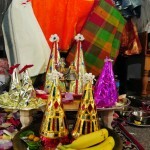 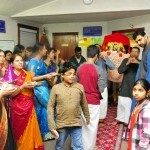 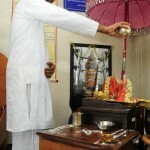 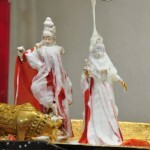 Other special events during the week-long utsav at Namadwaar included celebration of Nandotsavam (with children dancing around baby Krishna), Govinda Pattabhishekam (with special abhishekam to Sri Premika Varadan-Madhuri Sakhi) and Anna Koototsav, Radha Kalyanam (divine wedding of the divine couple), Madhura Gitam quiz (quiz on the compositions of HH Sri Sri Muralidhara Swamiji), beautiful Jhoola Seva at night amid diya lamps, Nikunjotsavam with a special vocal concert by Shilpa Sadagopan. 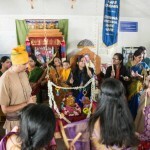 It was an exhilarating week that rejuvenated everyone and inspired all to do more and more kirtanam, katha shravanam and celebrate Bhagavan in their own lives!